Here's an interesting proposal from Just and Varma that tries to integrate what we know from fMRI studies about multitasking and complex problem solving. 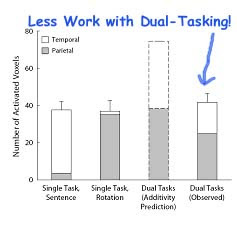 It discusses the interesting observation that at least in some cases, less brain work is used for solving two tasks at once, then the two tasks separately (underadditivity). 1. Each cortical area can perform multiple cognitive functions, and conversely, many cognitive functions can be performed by more than one area. 2. Each cortical area has a limited capacity of computational resources, constraining its activity. areas and to the functional demands of the task at hand. 4. The communications infrastructure that supports collaborative processing is also subject to resource constraints, construed here as bandwidth limitations. These are interesting ideas that have direct implications for classroom and lifelong learning. A remarkably little-mentioned topic in educational pedagogy is learning efficiency, yet at least when we see students who are have academic struggles of some sort, there are often obvious signs of where the failure to learn took place. Maybe basic skill sets for schooling should not be thought of as the 3 R's (reading, writing, and 'rithmetic), but rather beyond the memorization of facts and procedures, the efficient working of working memory and long term memory, the strategic use of brain resources for dynamic problem solving and multi-tasking, and the organization of ideas and perceptions for all types of output: verbal as well as non-verbal. Eide Neurolearning Blog: The Multitasking or Music-Tasking Generation?